Thanks to the feedback from nophead, Triffid_Hunter & yngndrw on the forums, I have updated my wiring to overcome the short comings (pun intended) of the Sanquinololu. The molex connectors are rated for c.1A per pin. Use screw connectors instead of molex. These are recommended by nophead anyway due to all the movement/vibration that these printer's undergo. Triffid_Hunter seems to agree as his Sanguinololu also has screw connectors. 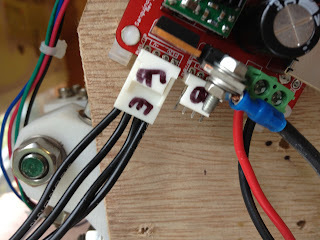 Connect the heated bed ground to the tab on the mosfet and the positive directly the the power supply using 13A wire, suggested by nophead. Double up by using all 4 of the molex pins. Mentioned by both nophead and yngndrw. I also took the time to connect up the additional 2 pins on the HotEnd molex while I had the soldering iron out. Thanks for the excellent posts. I was wondering if you could help me since I add the same "melting" on the heatbed connectors. Is the nophead really that simple? you just use the - connector from the heatbed on the MOSFET and the + on any 12V on the PSU? Can it be any power part? My PSU is 600W rated at 34A on the 12V ATX, but can I connect it to any other power part? Yes it really is as simple as nophead's solution. I have had my printer running as described in the post since April 2012 and have had no hints at a problem since then. It is My PSU is an old PC one rated at about 300W and handles it all fine. Make sure you use appropriately rated wire. Please also note that for my extruder I am using all 4 wires, i.e. 2+ve and 2-ve. That seems perfect, what kind of connecter you've used on the PSU side? I've noticed that on the Board you've used a Crimp Ring terminal, is it a 6mm? Thanks once again. I think it might be 6mm, just what I had in my toolbox. On the PSU side, I modded the PSU to have screw terminals, so on the PSU side I have the bare wire screwed down.